Sure! A soon as I finish the barrow chests. EDIT: Actually, if you are up for it, could you do a round one and an oval one? That way we can designate one as a shield and one as a tower shield in game. I don't think the oval shield from above is large enough to qualify as a tower shield... Then again, looking at vanilla shield models, it might as well. 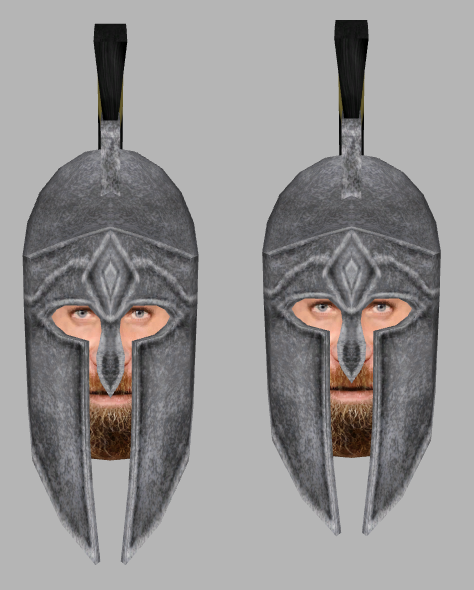 So, still working on finalizing a couple of the assets but I wanted to run something by you guys, how do you feel about dropping the greaves for the town guards, and doing it like the Indoril guards? 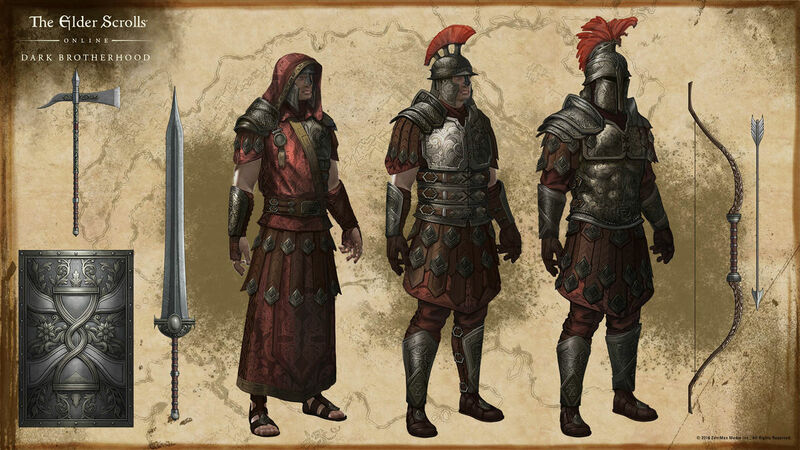 My thinking is, these guys aren't an organized military the way the Legion is, they're not necessarily going to be walking around in full armor - and these guard armors should be higher end sets anyway in terms of stats so they shouldn't really miss the one piece. I also prefer the look of just the pants, but maybe that's just me. From an in-universe point of view, it doesn't make sense to me that a town guard armor would have better stats than a legion one. 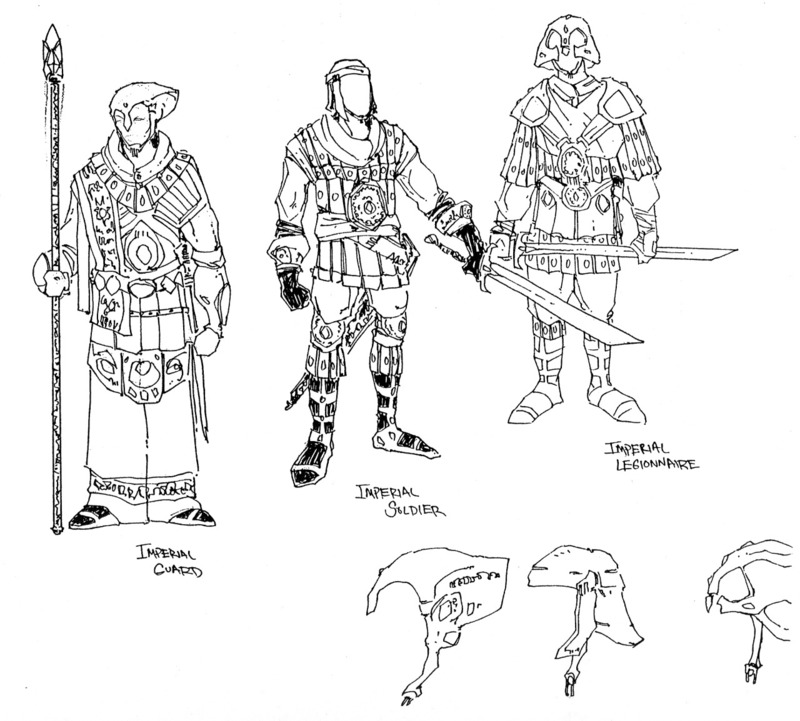 The bonemold-armors are made from a different material altogether, so I don't take those into account for comparison. I agree about town guards not needing to use a full suit of armor, though. I like the two new armor suits very much, but the more I look at the gold coast one, the more I'm unsure wether we should keep using it. Those pauldrons and the whole design of the cuirass feel goofy to me. Though, I'm probably a bit late with this critique, so feel free to ignore it. I agree about dropping the greaves, makes sense for these town settings that they wouldn't invest in full war armor. I don't see a problem with town armor being better than Legion armor: Legion gear is mass-produced, so it's not necessarily of a good quality. The effectiveness of the Legion is not due to their soldiers being better equipped or more skilled, but due to their advanced training, logistics and cohesion. worsas, I definitely appreciate your input, it is too late for me to be willing to scrap the design altogether, not least of all because that specific style of armor serves a thematic role with the three styles of guards (more Persian inspired for the Gold Coast) that I'm reluctant to change to something else - however, that certainly doesn't mean that I'm unwilling to make alterations if there's something that, in particular, puts it into that goofy territory for you. Would alterations to the belt area to be more like the reference image help, do you think? I know you had mentioned in the past that it might be too skinny. Also, does it look better with the pauldrons removed? I'm thinking about replacing the previous pauldrons with two golden belts respectively so this armor part does not consist of a mere chain sleeve. And I want to replace the belt with your above proposal and make the whole armor proportions more pronounced, so it's less tuby. I wonder, if we shouldn't also switch to the chain coif helmet. The roman style helmet and this chain armor don't go that well together, looking it at it. Or I'll try to mix it. I don't know yet. Can you post your latest version, so I can put my hands on it after the ayleid one? 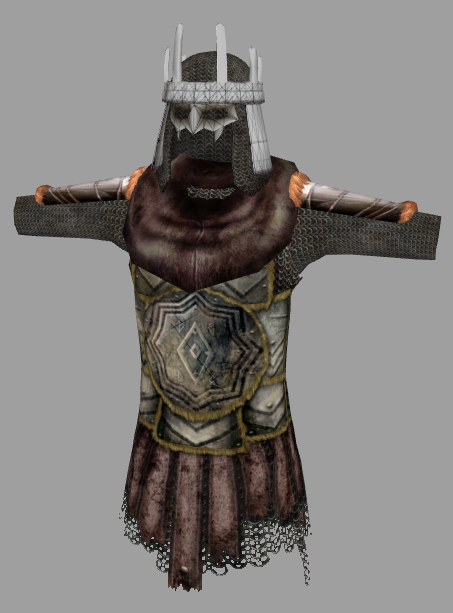 I would actually like to tweak the west weald armor aswell by adding in some modelled details beyond the currently very painted surface. worsas wrote: I'm thinking about replacing the previous pauldrons with two golden belts respectively so this armor part does not consist of a mere chain sleeve. And I want to replace the belt with your above proposal and make the whole armor proportions more pronounced, so it's less tuby. Alright, sounds good. 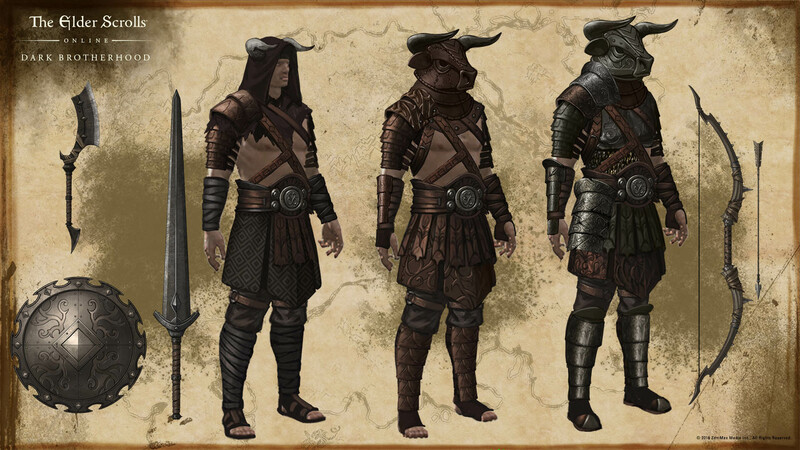 Do you have any suggestions for the highlands/kalantar set? It suffers from the same "just a chain sleeve" problem and I'm kind of at a loss with it. worsas wrote: I wonder, if we shouldn't also switch to the chain coif helmet. The roman style helmet and this chain armor don't go that well together, looking it at it. Or I'll try to mix it. I don't know yet. I'm not sure about ditching the helmet for the chain coif, there's certain things thematically that I'm trying to accomplish with the current model choices - they need to all feel like three flavors of the same core concept and have a similar, though distinct, silhouette so that the player will immediately recognize a guard the moment that they see one from afar. I don't really want to switch one to a chain coif type helmet unless we're going to do something similar for all three. 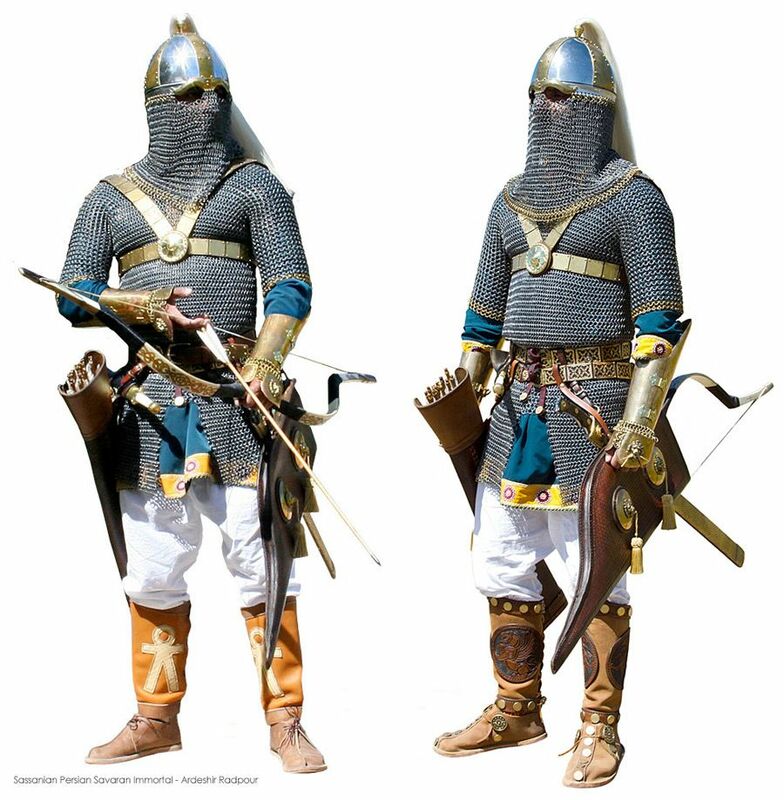 Would it help to add gold accents to the helmet to tie it in to the cuirass more? worsas wrote: Can you post your latest version, so I can put my hands on it after the ayleid one? I would actually like to tweak the west weald armor aswell by adding in some modelled details beyond the currently very painted surface. Absolutely, I'm looking forward to seeing what you can do with it, I agree it's very two dimensional right now. 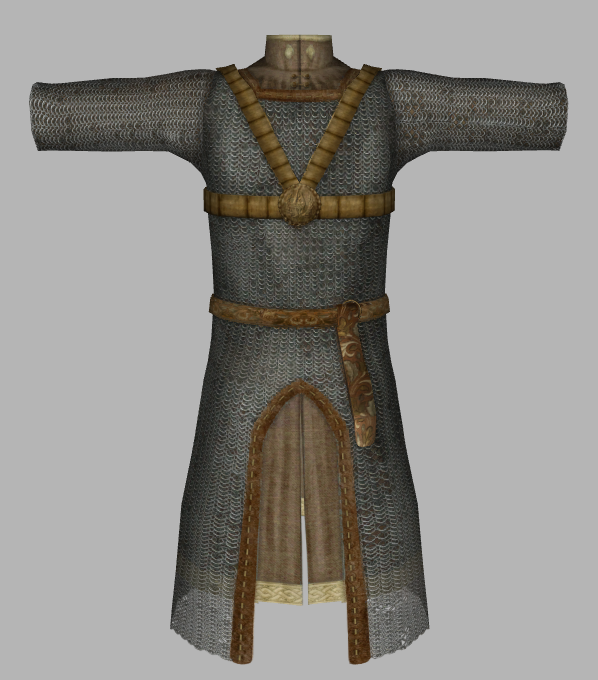 The latest version of the west weald/klibanion armor is the one that R-Zero posted up above, I'll post the Gold Coast/cataphract armor once I've textured on the details that need changing. fyi, that masked chain coif is very similar to the Strident Chain Coif concept art in the armor roadmap topic. I'm thinking about not really removing the pauldron plate from the gold coast guard armor, but changing it so it won't move down with the sleeve, but stay attached to the shoulder. For that purpose I would change a couple of details about the model. I would still add the previously suggested golden bands to the sleeve, so it looks less plain. I would like to make a shoulder plate for this one aswell. do you think you can upload what you have so far for the next data update, I intend to perform on the weekend between 17.-19. ? The tiber septim fresco would be an awesome addition to our range of frescoes. + also, if you got time could you make variations of the round and simple chapel windows for the other Divines? We could use them for the smaller chapels around Anvil and in Brina Cross. 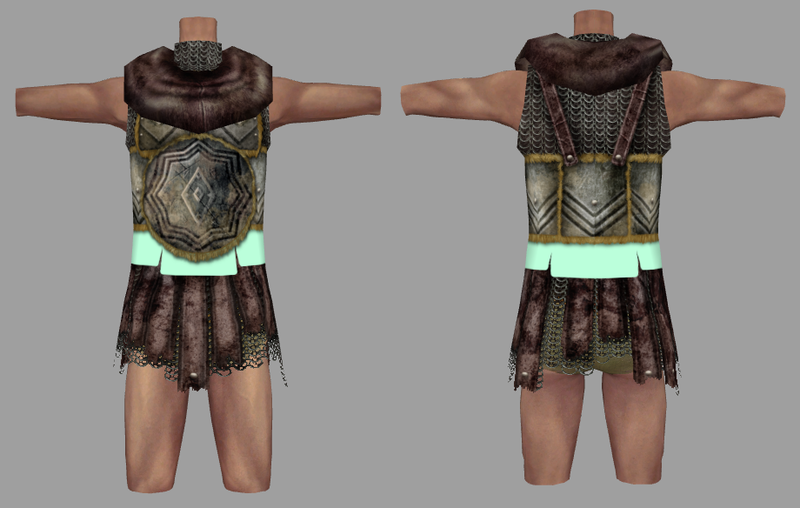 OK, long overdue but here's the guard armor files. I did a little bit of cleanup, all the filepaths and everything should be right. Once again, no plugin for this one - I'm sorry guys, I just don't have the energy to muck around in the CS right now - I have way too much on my plate right now unfortunately. However, this archive also includes icons for all of the armor pieces included so hopefully that helps. Frescoes will be sometime this weekend too, I'm trying to get all of my WIP projects at least uploaded so that if I end up going MIA for another several months y'all aren't stuck in limbo. Congrats on the public release, btw Sorry I wasn't able to get these to you in time for it, it looks great anyhow! EDIT: Speaking of things in limbo, don't expect a release on this anytime soon, but I did start preliminary texture work on a 2nd Era (Remanite? 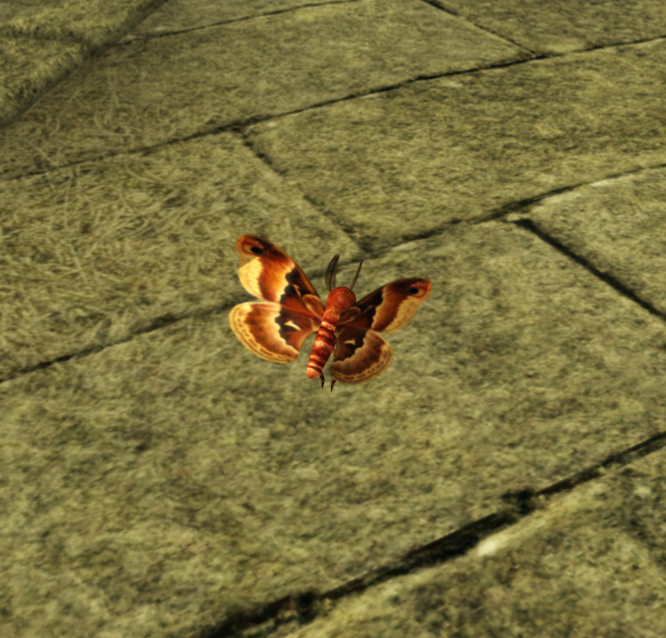 Ancient Cyrod?) armor a while back that we will be able to populate our dungeons with. Loosely based on this MK concept (the guy in the middle), mixed with this suit as we had previously discussed. The material will be a tarnished bronze. Progress update - changed my plan for the color scheme, it now matches the Colovian barrow weapons. Bottom row of plates obviously need work and I still have a lot of detail work to go but it's coming along lol. Ooh, this looks really nice. So is this going to be an armor set for the barrows or for the Reman ruins? So far, it's giving me more of a barrow vibe. Awesome to see you are back to work! @Infragris - This started out for the Reman ruins, but ultimately yeah, this'll be for the barrows. Of course, that now means I have no idea what I'm doing for the Reman ruins, lol. I can easily do something like ESO's Imperial armor since technically that's the most lore-accurate depiction of 2nd era arms and armor, although I'm honestly not particularly inspired by it, lol. I think honestly that the armor in MK's concept art is still our best bet for 2nd Era Legion stuff, especially since the barrow cuirass doesn't resemble it that much anymore. Personally, I interpret the Imperial soldier's cuirass to be a kind of studded leather strips affair, which would set it apart visually from the barrows set. I thought about it, my only concern is how well centuries-old leather would hold up - a few strips of rotten leather on an otherwise metal/mail cuirass is one thing, but an entire suit of leather I feel like would be falling apart by the late 3rd Era. I like the middle set you posted though, I could certainly work with that The helmet on the right is great too, the plume is really interesting. I'm implementing the new guard armors into the data files atm, and I had a question: the three sets will be named Cataphract, Klibanion, and Kalantar Mail armor, and the helmets can be named "Stirk Guard Helmet" etc, but what about the name of the boots? 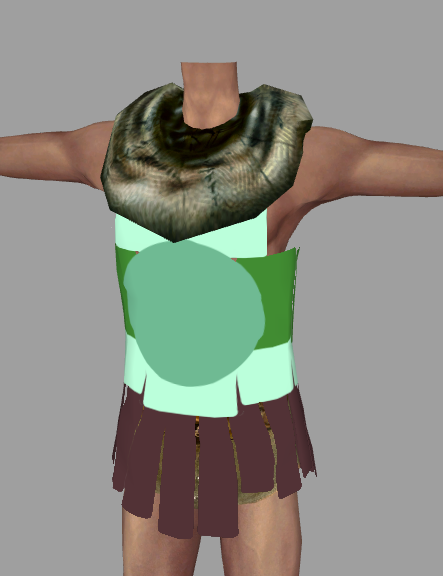 I don't want to cal them "Guard Boots" or "Colovian Mail Boots", since they would be the only armor piece with that name. I was kind of thinking about making three copies of them to fit the three mail armor sets. What do you think? They wouldn't be the only ones - the guard gauntlets (T_Imp_GuardTown1_GauntletX_01) have the same naming scheme. Personally, I think we'd be OK to have them as just "Guard Boots", as lame as that sounds, and save ourselves the data bloat. Three pairs of boots isn't a big data bloat, though, and I would like to use these armor sets as generic armor in lvld lists as well. I dunno - I think it could work.